Thomas Cromwell was the ultimate Renaissance Man. From humble beginnings as a tradesman’s son, he became the ultimate power broker in Henry VIII’s Court. He was born approximately 1485 in Putney, Surrey. He left England to become a mercenary, and, in his travels, learned several languages, developed a network of important contacts in mercantile centers and dealt with ecclesiastical issues for the Archbishop of York in 1514. By 1520 he became well known in mercantile and legal circles in London. In 1524, Cromwell entered into the service of Cardinal Wolsey. Under the Cardinal’s tutelage, Cromwell became astute enough to read other courtiers’ naked ambitions and gained the skill to manipulate them accordingly. In 1527, when Henry VIII questioned the validity of his marriage to Katherine of Aragon and desperately wanted to marry Anne Boleyn, Cardinal Wolsey was put on the hot seat. The Cardinal knew that if Henry set Katharine aside, the people of England would be in an uproar. Henry’s flexible conscience was clear and he was passionate on the divorce issue; he needed a male heir for England, and a divorce to marry Anne, who demanded marriage and promised to give him his heart’s desire: a male heir. As a clandestine Reformer, Cromwell encouraged Anne, who was like-minded in her religious beliefs and eager to marry the king. Cromwell supplied Anne with forbidden books written by men who were fervent advocates for an English Reformation. When Anne brought these books to Henry’s attention, the grateful king made Cromwell his principle secretary and chief minister by 1534. Both the nobles and the commons feared and hated Cromwell, but none dared speak against him. As Queen of England, Anne made a fatal mistake that cost her Cromwell’s support. She had Cromwell denounced publically for putting all monies from dissolved monasteries into Henry’s treasury rather than for her charities, and threatened to interfere with his standing with the king. Knowing that the king was tired of Anne, Cromwell acted swiftly and assisted Henry to remove Anne to make way for a young and gentle Jane Seymour, even though it was rumored that Jane was of the old faith. Cromwell succeeded and in 1536, the friend turned enemy witnessed the first execution of an English queen. It must have been unsettling to Cromwell to realize that he was in power because of the Boleyn’s initial support and yet he played a major part in Queen Anne’s destruction to maintain his power. Little did he know that in 1540, the king would strip him of his high offices and he, Cromwell, would walk the same path to his death. Friend turned enemy – a “Frenemy “indeed, and in deed. Thomas Cromwell is a compelling man to study. He was born in humble circumstances and left England behind at a very young age to make his way abroad. In his own words, he described himself as a “ruffian…in his young days”. Yet this is the man who became the most powerful man, next to the king, in the Tudor court of the period between 1524 until his execution in 1540. Cromwell never wasted an opportunity to make a business connection, or learn a language or a dialect – his prodigious memory absorbed cultures and languages which would be put to good use in Henry’s court. Cromwell had an iron will, nerves of steel, and a formidable physical appearance. He gained admittance to the highest circles of court life and enjoyed full access to both the king and Anne Boleyn. Once Cromwell obtained a seat in the House of Commons in 1523, he caught Cardinal’s Wolsey’s attention and his rise to power was on fast-forward. I find it fascinating that, in a court full of scornful nobles whose hatred was palpable, he continued to rise. Talk about a “Teflon” man! Nothing seemed to stick to him or bother him! Wolsey’s spectacular fall from the king’s grace in October 1529 left the nobles and commons rubbing their hands together in glee! At last Thomas Cromwell would get his comeuppance and get booted out of the court! Yes! Finally he could go back to the “dog hole” where he belonged. What!! He didn’t? By November of the same year, Cromwell managed to gain a seat in Parliament, was one of the king’s favorites and by the close of 1530, Cromwell was appointed by the king to the Privy Council. Cromwell was a modest and no-nonsense man in spite of all the offices showered upon him by the king. I find this attitude refreshing in so powerful a man. He cared only that the king ruled absolutely and was intelligent enough to know that the king needed him to manage his affairs for him on a daily basis. You cannot help admiring a man who came from literally nothing, left England with nothing, yet came back and became the ultimate power next to the king for a while. Unfortunately, when Cromwell did fall from the king’s grace, his fall was swift and brutal. It is my humble opinion that Henry had reason to grieve for Cromwell’s skills long after his death. Henry then realized Cromwell’s true value as his “go-to” man. In today’s society, could he be compared with a powerful Senior Vice President of a large corporation, without a college education and business degrees? And without the polish of a man of that standing? Could he rub shoulders at high level meetings with clients from Tokyo, Brussels or Washington without causing offence with his coarse appearance? That is how I think of Cromwell were he alive in today’s world. I can picture him, banging away at his computer, reading reports, barking orders to staff and staying late in his office every night, with empty food cartons scattered around his desk. 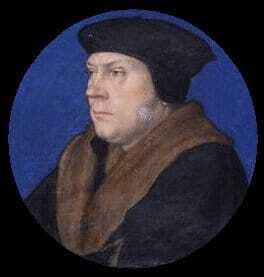 Thomas Cromwell: power broker, queen maker, and king’s right-hand man is truly remarkable to me. Terrific article! Read and watched Wolf Hall and gave us more interest to read up on more major players as “Crum, Wolsey, and even Hans Holbein. I think that Hilary Mantel’s depiction of him in Wolf Hall is spot on. The TV series of this book also did a great job with Cromwell. He comes off as a very complex character, intelligent, shrewd, successful business man, full of common sense, no nonsense. A family man, but tough, very tough. Ruthless. Not afraid to do cruel things to stay in the King’s good graces. Not afraid to get his hands dirty doing Henry’s dirty work. His portrait by Holbein makes him look like someone you didn’t want to be on the wrong side of, and that’s what happened to Anne Boleyn. She didn’t get just how dangerous this man could be. Neither did the men accused of committing adultery with her. The scenes in the show where they are making fun of Wolsey’s fall (repeated a few times) show him to not regret their fall. He seems to have regretted Anne’s fall, even though she talked down to him. But, despite his intelligence, and all he had going for him, it didn’t prevent him from meeting the same fate a few years later. Henry always needed someone to blame, and the blame game finally caught up with Cromwell.